Shh, I’m not actually officially doing Me-Made May this year. I didn’t properly sign up and make a pledge or anything, since I wear me-made nearly every day anyway. But it’s a nice excuse to show what I do wear day to day and how my handmades fit into my wardrobe and life. 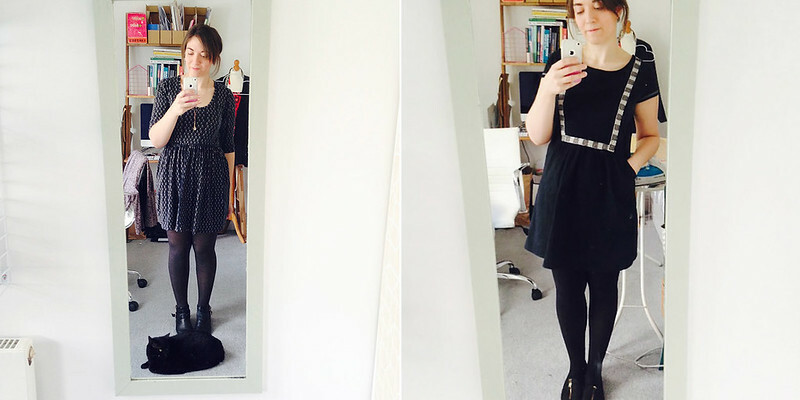 What I’m noticing since this time last year is a) how many more good quality makes I have that fit my style and lifestyle b) how much easier I find it to get dressed these days, due to point a) and my ruthless and ongoing Konmari clearout. Exhibit a: little black dresses. Plantain and to-be-blogged self draft. Exhibit b: print dresses. Two Holly hacks in fact – kitty and wax cotton. Exhibit d: black skinny pants + colourful top + cardi. Colourful by my standards, which is still pretty sludgy, ha. Left: Morris and Gingers with a Marc Jacobs tee. 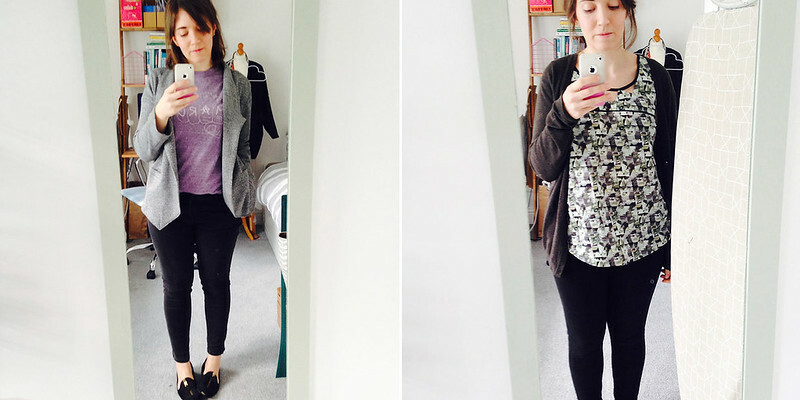 Right: Datura, Uniqlo jeans, ASOS cardi. 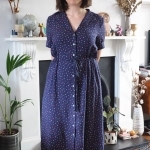 I haven’t had too many major revelations re things I need to sew more of, but one thing I would like for spring/summer is more midi length dresses that I can wear tightsless without feeling cold or self-conscious. I’d also like a couple more skirts so I have top + skirt options alongside top + pants or dress. And more Gingers, always, so I can retire my RTW ones. I’m calling it a successful MMM so far! How’s everyone else getting along? I have noticed the same thing for myself! Not sure if it’s bad to have a uniform – at least I like it! Would be happy to share travel tips with you if you’re headed out to California, or join a meetup! That would be fab! I’ll definitely drop you a line nearer the time. Have been to SF before but pre-sewing so store recommendations are definitely welcome. I’m definitely noticed a bit of a consistent trend of separates in black & white then a pop of colour. Hadn’t realised myself until somebody else pointed it out on Flckr. 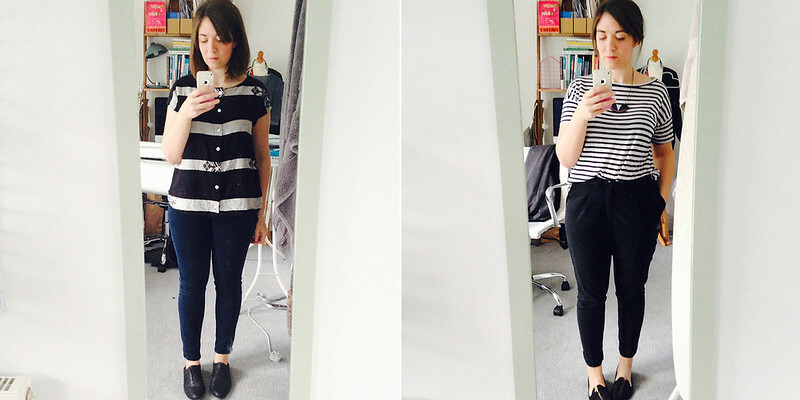 Your wardrobe is looking pretty darn cool Katie. Looking forward to seeing the rest of your items. All your outfits look great and I love that you have your own unique style! I think it’s a good sign when what you like to wear becomes clear, especially once you have multiple options for each of your favourites! This is definitely becoming true for me, and like you I definitely need to make some more ginger jeans and perhaps some skirts that I feel good in. I’m always on the hunt for an alternative to skinny jeans, too. Oh me too, those Burdas are a great alternative and I want to make some ‘posh’ work-appropriate slim joggers too. I love the new Papercut trousers too. Like you I’m not an official participant as I wear mostly self made too, and my work outfits from last year are still going strong and thus intensely boring…. So this year I’m just trying extra hard on my days off to come up with new combinations and forcing myself to do mending, alterations and match up orphans. 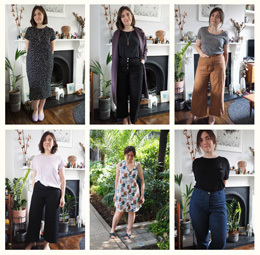 I remember one of the first posts of yours I read when I first started following your blog mentioned you wanted to make better quality clothing and a more cohesive wardrobe, so it’s great to see you’ve achieved it! Ah, that’s a nice thing to be reminded of, thanks! Predictable is good, it means you know your style. Great outfits! The to-be-blogged self draft looks amazing! Coming up this week – I’ve worn it twice in May already! I think you’ve got a fantastic style. Isn’t it great to know what you like and what suits you?! It is, just need to keep things interesting sewing-wise too! I love everything you make and wear! You’re so stylish! It’s very cool to have a distinct style! My Me-Made-May has so far shown that my style is a big mixed bag of impracticality, so I’m quite envious of your consistency and cohesiveness! I love it! I’ve applied it to all ‘my’ parts of our apartment and hoping it rubs off on the fella too, ha ha. I’ve also noticed the difference to my sewing. Your outfits fit you well and I love your style! Especially the short sleeves woven dresses. 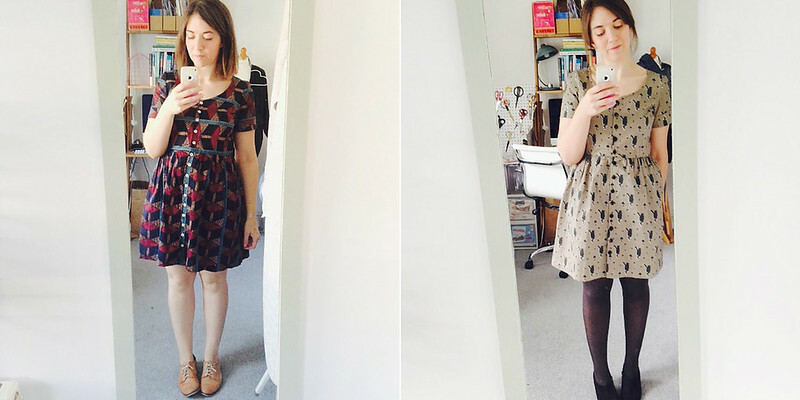 Thanks for sharing how your makes function in everyday outfits, very inspiring! Thanks! 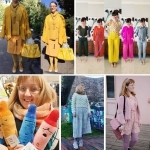 I liked your post about your thoughts on MMM and blogging – I absolutely sew for my wardrobe and not purely for good blog content (as my sometimes repetitive projects demonstrate, ha ha).